Billboard advertisements in Ağrı for Asya Elmas, presented in recent local elections as the People’s Democratic Party (HDP)’s Kadıköy Municipal Council candidate to promote the HDP’s Presidential campaign propaganda, have drawn public reaction. People in Ağrı have reacted harshly to a poster picturing transvestite Asya Elmas, displayed on a billboard on Kağızman Avenue in support of HDP Presidential candidate Selahattin Demirtaş. Asya Elmas was presented in the local elections by the HDP as a candidate for the Municipal Council in Istanbul’s Kadıköy district. 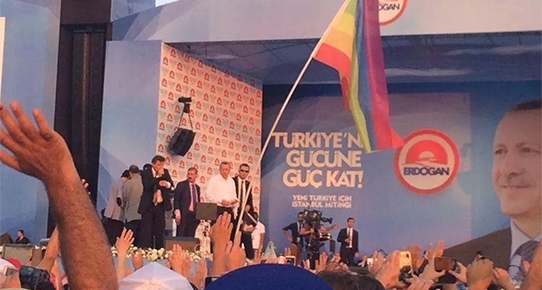 The group named “The LGBTI of the AK Party” attended Erdoğan’s Maltepe rally. The group displayed a rainbow flag at the rally site and in front of the podium. Before the rally, representatives from the group spoke to Milliyet’s Damla Yur and explained that they had support from the party administration. The AK Party’s Afyon Deputy Halil Ürün had asked, “What is LGBT? I have no idea. How should I know about it? We are ignorant about these issues.” The goal of the AK Party’s LGBTI members is to change the negative perceptions of right wing and conservative sectors against LGBTI people. The group entitled “The LGBTI of the AK Party,” founded on 30 March, already has 937 followers on social media. Three hundred of these followers are assumed to be AK Party members but only 11 people attended the initial meeting. “There are some very active party members in our group. An AK Party affiliated mayor sent us a congratulatory message when we first founded our group. We are not only in touch with AK Party. We have also received support from the LISTAG (Families of LGBTs in Istanbul) Family Group, Hevi LGBT, the Istanbul LGBTT Solidarity Association and other LGBTI groups. Presidential candidate Selahattin Demirtaş: “The existence of LGBTI is perceived as a crime. Homophobia and transphobia are being fed. The ‘call for a new life’ is for sexual freedom in society. Presidential Candidate and Co-president of HDP (Peoples’ Democracy Party), Selahattin Demirtaş, presented his policy declaration titled, “Call for a New Life,” in a press conference held at the Şişli City Cultural Center. LGBTI comment from İhsanoğlu: Society has Sensitivities! Presidential Candidate Ekmeleddin İhsanoğlu said, “Our society is a conservative one. Society has sensitivities” regarding LGBTI rights. İhsanoğlu has no projects, promises or statements on LGBTI people killed because of “the sensitivities of a conservative society” or hate crimes. Your statement in an interview with Al Jazeera where you said “Homophobia is not a universal issue” remain in the archives. What is your position on LGBTI people’s rights and place in society? Of course this is a very sensitive issue. On the one hand there is the human rights aspect on the inclusion of these people in society and on the other hand there are society’s sensitivities. We must think about this within these two parameters. How do we find that balance? What is the formula to get over society’s homophobia? We can say that it is a concept that summarizes extreme attitudes of denial and exclusion of LGBTI people. We should consider these sensitivities. It would not be correct to approach one side heavily. And there is this: our society is a conservative one. We have to think about the sensitivities of a conservative society. We have to be respectful of the values of 76 million people in Turkey. There are people who behave like this and who defend their rights. So you see the free expression of sexual orientation as a right, correct? There is a majority that is against this as well. It is not possible for me to answer this when I am trying to make it to the airport.